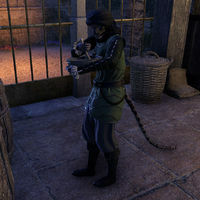 Daiharri is a Khajiit cook found in the courtyard of Hubalajad Palace. She will be preparing meals for those attending the wedding of Magnifica Falorah and Cosh. Daiharri: I said the food is not ready! Now go, before I beat you with a spoon! Olmarinn: I just wanted some chicken! Once Dashka has been lured to Daiharri's counter. Daiharri: "Get off the table! Someone take the dog away before this one turns it into soup!" Zadrik: Problems already? They should have watered down the drinks." This page was last modified on 13 February 2019, at 08:34.